The process of building conservatories can be fairly lengthy from the initial planning application (should it be required) through to the completion of the installation so it’s a good idea to plan well ahead and aim to have your conservatory finished for when the nicer weather arrives in the spring. If you want peace of mind when choosing a conservatory supplier, then you may decide that going with one of the larger national companies is right for you but our national network features many smaller local companies who supply high quality conservatories. You should always get at least 3 like for like quotes for your conservatory and then make your decision based on all factors and not just price alone. Consumer tip: Always do your own research as to whether or not your conservatory will need planning permission and don’t just rely in the advice of the conservatory company. 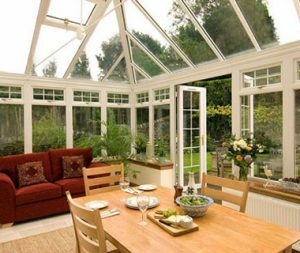 Unlike hardwood conservatories, UPVC structures don’t need any protection from the elements and won’t crack or peel like wood can. There is no regular painting or anything else needed and your conservatory company will usually provide a guarantee to back this up. PVCU has excellent insulation properties so it will retain more heat during the colder months so you can use your conservatory all year round if you have a source of heating in it. If you’ve bought a nice white UPVC conservatory, then you will want it to stay that way over a long period of time. One of the many benefits of UPVC is that it’s not prone to discolouration. The three benefits above and the fact that PVCU is the lowest cost conservatory material makes it easy to see why it’s the most popular for UK conservatories. Consumer tip: Check that your conservatory installer is a member of the GGF (Glass & Glazing Federation) to ensure that the windows in your conservatory are fitted to a high standard. ← What are Bay and Bow Windows?